Sunset Outdoor Supply is your number one Ventrac dealer. 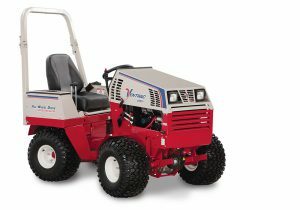 Visit us today for Ventrac equipment and more. 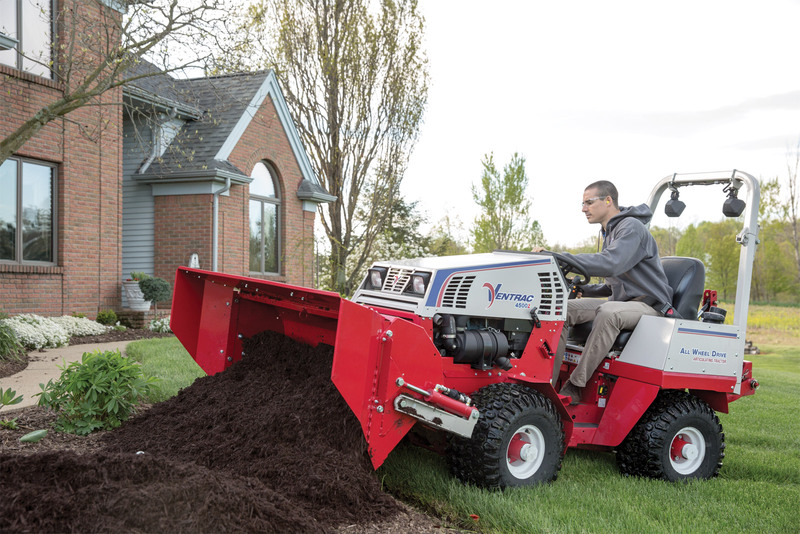 Ventrac Power Buckets are hydraulically controlled from the driver’s seat, allowing for smooth, effortless operation. The Power Bucket is designed to sit upright after detachment, with the lift arms in the proper position for direct reconnect when the bucket is used again. Need Support On A Project? Ask Us, we can help! We are the solution for all seasons, next time you need supplies think Sunset Outdoor Supply "S.O.S." All the machinery, equipment, parts, and accessories we sell are made in the USA. © 2019. Sunset Outdoor Supply. All Rights Reserved. 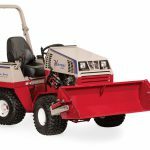 Ventrac 4000 series tractors with cabs, snow blowers, and brooms. 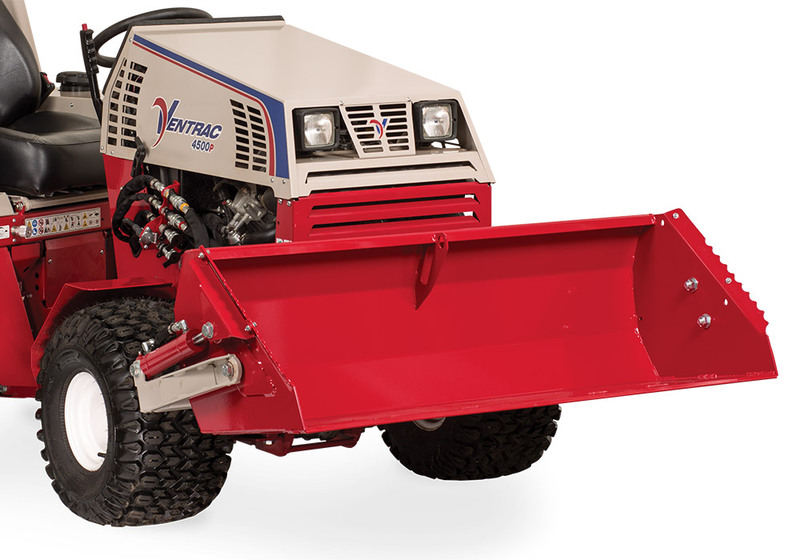 Deerhurst Resort home to the Canadian National Pond Hockey Championships would not be successful with out the partnering with Ventrac. Imagine 26 hockey rinks, 150 feet by 75 feet, that’s 292,500 sq/ft of ice to maintain and the best piece of equipment we use is Ventrac. What a difference having your (Ventrac) machines. The bay will likely be cleared in 16-20 hours and the last 2 years I have been here we averaged around 50-60 with the quads and blades and not near as perfect as we got it today. Man, am I happy to be teamed up with your equipment. The versatility of this unit is unmatched!!! We used the snow blower attachment to remove the snow from the ice, a straight blade to form the rinks, and the sweeper attachment to make it perfect. There is not one piece of equipment on the market that can match it’s performance. It is simply the best investment. Currently owns a Ventrac 4500Z with 12 Ventrac attachments and numerous other-branded attachments and implements (over 35 attachments total). My home is located in a very hilly area with many ravines having slopes of up to 30 degrees. Thus the capability of the Ventrac 4500Z tractor with duals to operate safely on such slopes is the major reason that I am a Ventrac owner and fan. 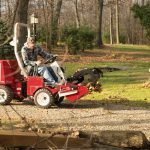 Over the years there have been 9 major incidents in my immediate neighborhood where 2 wheel drive lawn and garden tractors have either rolled or run-away downhill out of control. Some of these resulted in injuries. With the Ventrac I now safely mow some of the steeper slopes belonging to my neighbors in addition to my own. They are grateful for the assistance, and I get to enjoy the ride. For me mowing is a recreational experience! The traction advantages of 4 wheel drive are apparent to most people, but I find the secure down-slope braking ability to be one of the most important assets of this type of chassis. 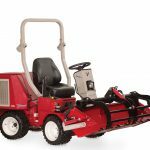 In addition, with dual wheels on the Ventrac 4000 series tractors, operation on side slopes of up to 30 degrees is both practical and safe. 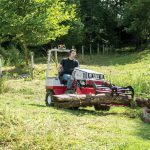 The articulated frame of the Ventrac also provides another advantage over conventional garden tractors and compact utility tractors with 4 wheel drive. When steering the Ventrac, the front and rear wheels turn at the same speeds and follow the same tracks, so the turf is not disturbed. I use my Ventrac 4500Z for many different applications. It not only serves as my workhorse, but it is also one of my major hobbies. 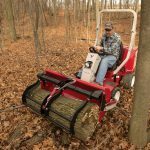 I have 12 Ventrac attachments and numerous other-branded attachments and implements that I use at home, at church, and to help maintain the trails at Nahant Marsh, a wetland preserve located near Davenport, Iowa. On the other hand, I don’t have a sports car, a boat, an airplane, or a therapist. On July 21, 2008, a derecho with winds over 100 mph struck in my neighborhood taking down numerous trees and power lines. My Ventrac powered the generator to provide emergency electrical service to our house for several days totaling 119 straight engine hours. It was only stopped for refueling and oil changes. Impressive performance when we needed it most! 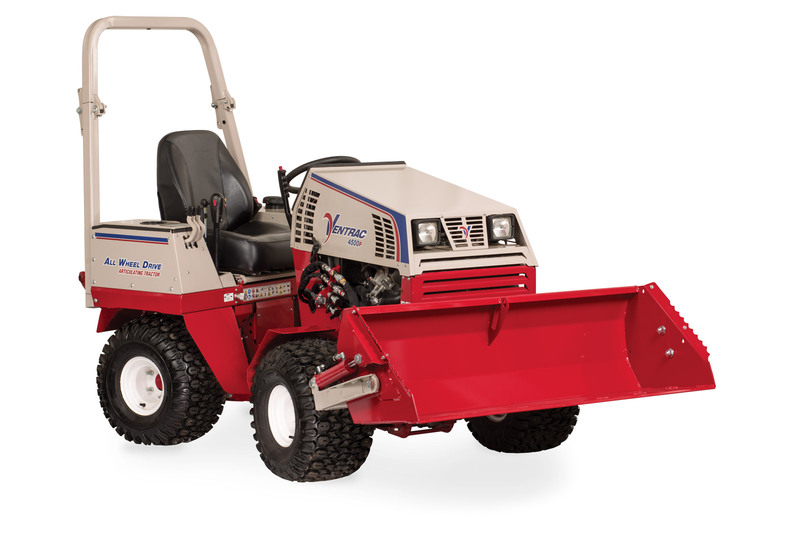 The design and construction of Ventrac equipment is outstanding—everything is “built like a tank” and easy to maintain. In addition it is just plain fun to operate and satisfying to see the quality results in the work accomplished. I am also very pleased with the responsiveness and competence of my Ventrac dealer. 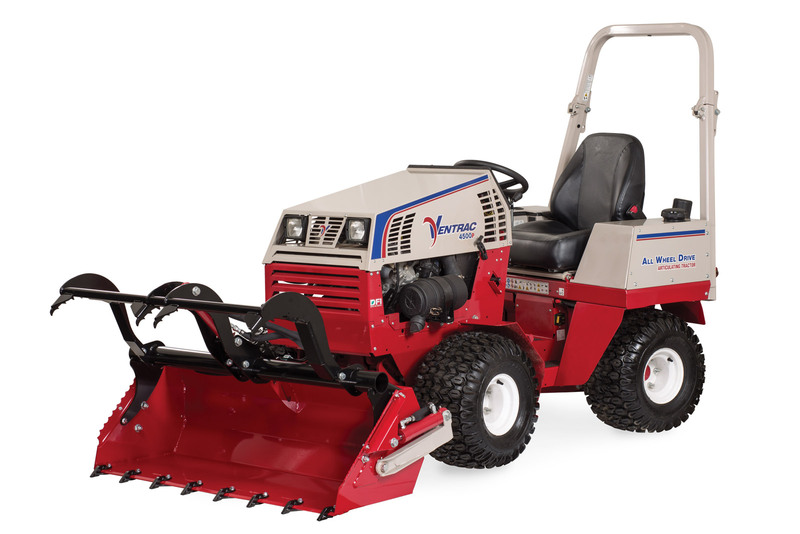 I am sending 40 photos of my various applications for your consideration, but I consider the one below to be the most important in illustrating my need for Ventrac equipment. The slope here is 28 degrees. Please use this photo, if no other, in anything about me and my applications that you post on the Web or use for advertising purposes. It best illustrates the essence of why I am a Ventrac fan. I am delighted with Ventrac products and the people that provide them! Although my husband loves Steiner tractors, he gave me the choice of tractors when I retired as I am the one who does almost all of the mowing. 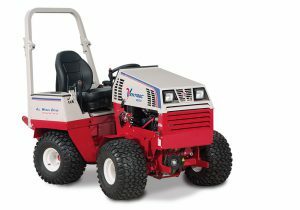 After test driving Steiner and Ventrac, the Ventrac was the one I chose. It just was easier for me to handle and understand how to operate. I have been using my Ventrac for 2 years now and have had no problems with it. Because I chose Ventrac over operating all the Steiner tractors my husband owns. I use the Ventrac to mow around my 7.5 acre Christmas Tree plantation. 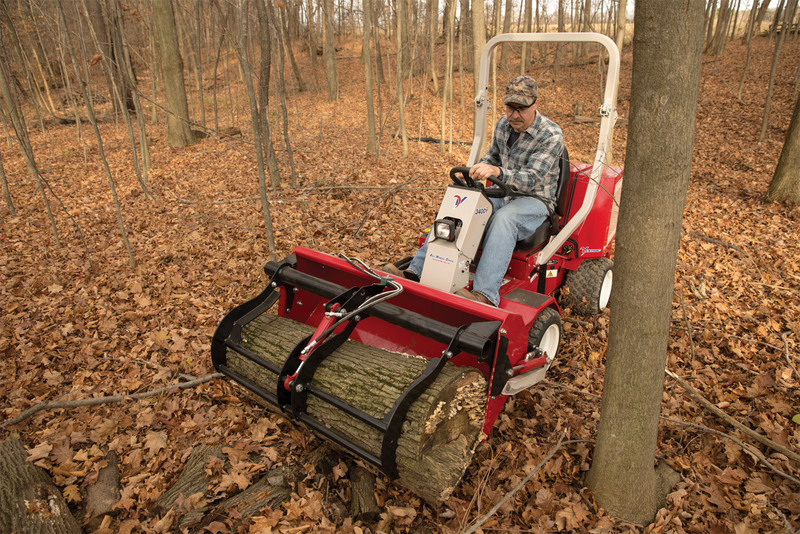 The rough-cut mower does a great job clearing the vegetation between the rows of trees. I save gas and time by being able to complete these tasks quickly. 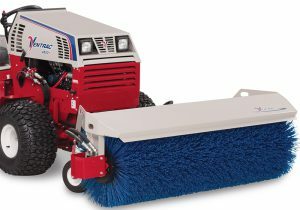 I also use the 48″ blade to clear snow on my sloped, 500′ driveway. The little tractor does an impressive job. Ventrac is the best piece of equipment I’ve ever used! I have never felt as comfortable on our many ups and downs as I do on the Ventrac. There are a few tweaks that I would make, but nothing that would steer me away. Thank you Ventrac! When I bought my 4.5 acres of Hudson riverfront property back in 1997, I was concerned about the uphill battle of mowing 3 – 4 acres or lawn as well as having to blow out 250 feet of driveway, all with steep terrain. I passed a dealer in Rondout Valley NY who had a Steiner 430 tractor out in front. I knew immediately this was the only tractor for my property. The dealer, Tony Kowalchuck, Sr., was truly so enthused about his product that his passion was infectious, and I soon became as passionate about my tractor’s performance as he was. 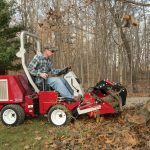 I initially bought the Steiner 21.5HP diesel and several attachments including a 60-inch mower deck, a 48″ snow blower, a slip-scoop, and the leaf blower. Over the next few years, I added a 10,000KW generator and a stump grinder. My property was transformed into our own backyard garden of Eden. Tony Kowalchuck had given me great support over the years along with his son Tony Jr. and when I noticed a shiny new version of Tractor in their shop, I became aware of the Ventrac line. This new tractor seemed to rectify a number of short-comings that the Steiner had, most notably for me a rollover bar and increased horsepower that could help tame my steep terrain. However, these are not low-end tractors or garden toys one would expect to find at a typical big box store, and I just wasn’t prepared to lay out for a new tractor when my existing one met 90% of my needs. Then, unexpectedly, the diesel tractor threw a rod due to a rollover mishap that had happened a few years earlier and I was faced with the dilemma of having to replace a relatively new tractor also knowing that I had a huge investment in attachments. Tony Kowalchuck came to the rescue and made me a great trade-in offer on my broken Steiner and I went home with my new Ventrac 4231. There were several key issues that made me buy the Ventrac. First of all, I knew I had one of the best dealers and friends and that was a huge factor in my decision. Second, the roll-bar on the Ventrac would help protect me on my varied terrain and unexpected lapses in judgment. Next, my diesel was sometimes hard starting in the winter unless I used the block heater. However, when the electric power was out because of winter storms, pre-heating wasn’t an option and I couldn’t get my Steiner going to run my generator. That was a big factor in my decision to go with the 31HP Ventrac gas model. Then of course, I knew I would be able to leverage all of my investment in my Steiner attachments that fit perfectly on the Ventrac with some slight adjustments in belt sizes. 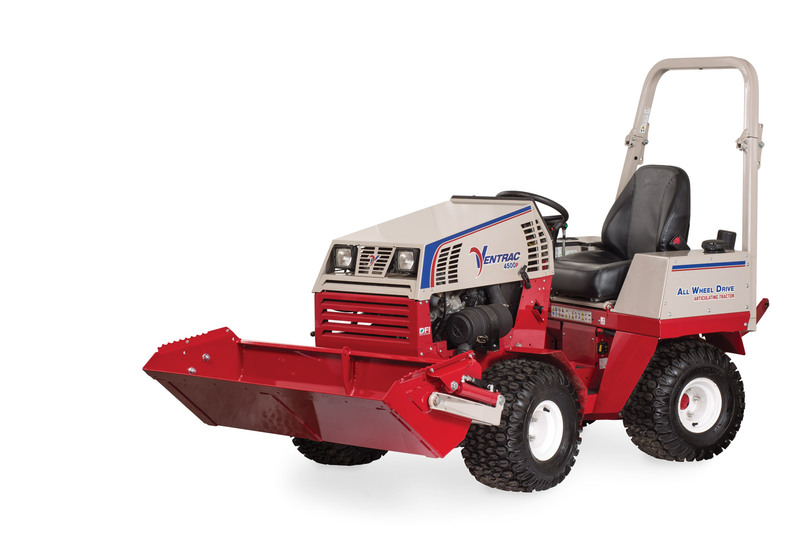 I was so thrilled with the increase in power and handling ability of my new Ventrac, I quickly replaced the 60″ Steiner mowing deck with the 72″ Ventrac deck. I love the flip-up feature of that deck for routine spindle greasing and blade sharpening. 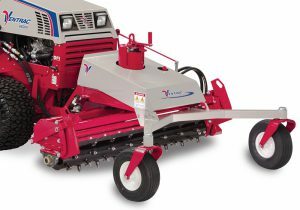 I also purchased the 48″ Ventrac Tiller and I am continually amazed at its ability to take the roughest ground and turn it into pure fluffy soil that is the easiest to plant and maintain. I have added the extra spotlight light bar and emergency beacon to the top of the roll-bar for when I venture up onto the roads in winter to blow out the driveway, and some added features of my own like stereo system and headphone jacks to make the mowing a little more enjoyable. I’m just starting to train my 11-year old son in safe use of the Ventrac and he loves doing tractor work for me now all the time. I love my Ventrac as it cut my mowing time in half versus the old Steiner. This machine is built with incredible toughness and with the right maintenance, performs just like the day I brought it home new. The best factor throughout all of the ownership period is clearly the dealer support from Tony Kowalchuck Sr., his wife Cathy, and their son Tony Jr. They always do their best to help keep minor un-expected repair, use-oriented wear-out costs and maintenance as low as possible, and they are always there for advice. That’s a quality factor you can’t manufacture, but says a lot about who the Ventrac folks allow to represent their product and the process in determining that. No surprise there. 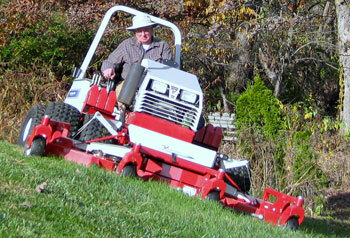 I’m always excited to visit the Ventrac website and see what new attachments they have dreamed up. The support from the manufacturer’s staff has also been outstanding in my opinion. They are always timely with responses, and generous in consideration of issues that may not have been my fault entirely. The entire Ventrac team should be commended for the highest level of possible customer service and support. I have always been an ambassador and sales guy for the Ventrac tractor since day one. No one is more impressed with the quality of construction, ease of use, safety, and consistency of support. It makes the toughest jobs so easy that I always blow out my neighbor’s yards in the winter and save them lots of money. I till vegetable gardens for friends and helped transform one of my neighbors’ spare land into a fertile planting area where he now runs a CSA called Stonegate Farms. He would love to buy a Ventrac, but knows until that time, I’m always there to help him out. I got the Ventrac fever 5 years ago from Tony Kowalchuck and he’s right, it was one of the best investments I’ve ever made. 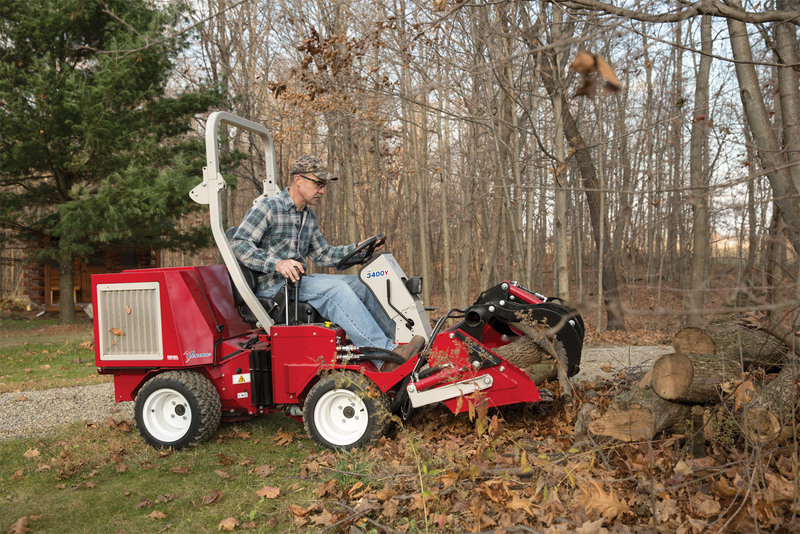 We operate three (3) 4200 VXDs w/ dual wheels, three (3) 72″ mowing decks, two (2) 60″ Tough Cut mowing decks with optional casters, one (1) Aeravator, three (3) power angle blades, one (1) stump grinder, and two (2) blowers. LU is often referred to as “Liberty Mountain,” since it was actually placed on the western slope of Candlers Mountain in Lynchburg, VA. As a result, we have a LOT of large banks on campus, and all of which the administration wants maintained. I’ve racked up about 4000 hours of operating time mostly mowing these bad boys…it’s a full time job. The Ventrac does what no other machine can do, and safely…we mow hills, even while students are busily shuffling around us, with no fear of losing control. We also hold a lot of off-campus properties, for communication towers, off-site storage, etc., and have used our units for chain-hauling large trees we felled (up the side of the mountain, no less! ), and even for pulling out stuck vehicles. They are definitely the work horses of our operation. I operate the 4200’s as a full time job in all seasons. I also do the majority of the upkeep on the units…I know them inside and out. I can tell if one of my tires is more than 1 lb. off of the desired pressure (high or low) based on how the unit behaves on a slope. Ventrac has basically been my entire professional life for the last 5 years. I live in northern Maryland and we got hit by 2 blizzards in 1 week. I have never seen this much snow at one time in all my life. I have an 1100 ft long driveway and I had snow drifts between 3 and 4 feet deep. With my Ventrac and a dozer blade I was able to plow my driveway. It took me about 3 hours. After I got out I did all my neighbors driveways as well. I was so impressed by the strength and power of my 25 HP 4100 Ventrac. A few days later I had to do it all over again. You should have seen the look of relief and amazement on my neighbors faces. When they we standing in their driveways with their shovels when I pulled in and plowed them out 1 driveway at a time. That day I got in from plowing and I decided that it was time for a snow blower. I called my buddy Jim from J & R and asked him to find me one. Three days later Jim delivered my new Ventrac snow blower. Now I have to sit and wait for the next big snow. I am hooked on Ventrac. I have a friend who has a landscaping company who asked me to lend him a hand with a job. My friend was contracted to mulch a memorial garden for a hospital. I showed up with my Ventrac and started moving mulch to the beds at 7 am. We had 6 guys spreading and I was supplying the mulch to all of them. I had to run 100 to 200 yards for each load using nothing but my 4100 with the slip scoop. Due to the hilly terrain and wet ground no other tractor or truck could get in without leaving huge ruts in the lawn. By 5 pm we had spread 144 yards of mulch and completed the job. This job took 3 full days the year before without the Ventrac. Everyone on the job was amazed at the speed, agility, and ability of the Ventrac. I know of no other tractor that could have done this job and left the grounds looking virtually untouched. I am a dedicated fan of my Ventrac. I look forward to snow storms, lawn jobs, and mulching jobs ever since I have owned my Tractor. I am the kind of person who likes to help out my family and friends. Owning a Ventrac makes it possible for me to do more work in less time. Thanks Ventrac. This past week Harrisonburg Virginia received a foot and a half of snow in two days. My grandpa lives on a pretty steep hill, and the Ventrac was the only vehicle that could make it up and down the driveway to plow the snow. All the other trucks and jeeps (with 4wheel drive) kept spinning out and getting stuck. The Ventrac then proceeded to dig about 5 other houses out of the snow, and made Smith Street drivable once again. Thank you Ventrac for saving the day! We were looking for a machine that could go in small area. The Ventrac is a great machine in vineyard. We had a moving deck done just for us adjustable that work great with the Ventrac. With the size of our vineyard project any attachment we can add to the Ventrac can only simplify the work of my 20 men. I have approximately 3.5 acres of grass on my property and after finishing a major remodel to the house I was left with 400 tons of earth to keep. My wife and I decided to create a plateau in the middle of our property since it is all uphill from the street with the home on the top. But after trying to cut that new slope with my old Garden tractors and zero turns, I looked for help. 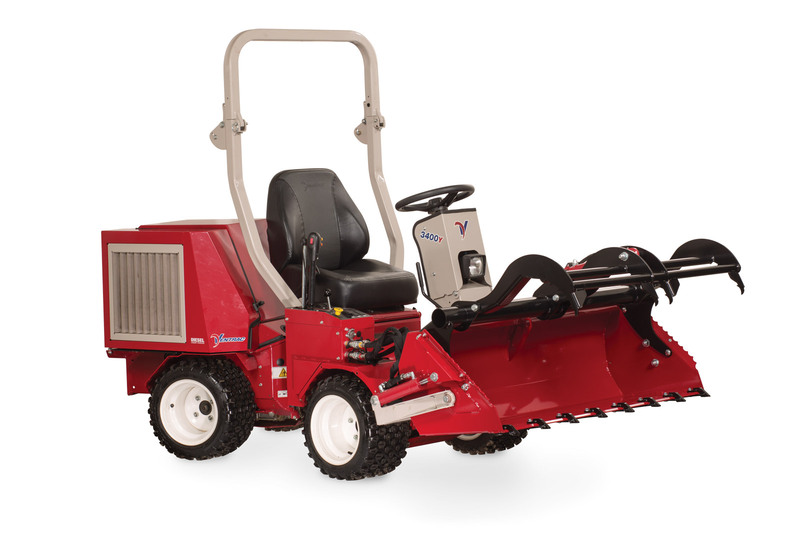 After extensive research I settled on VENTRAC 4231TD with dual wheel kit and 72″ deck. My new slope was seeded with Bluegrass and 12 various trees and beds. After my first DEMO with the dual wheel kit I was sold. I was able to mow completely around these beds midslope cutting both on side hill as well as up and down. The control, traction and stability on this slope is amazing. I can do figure 8’s on these slopes where I would barely be able to walk. 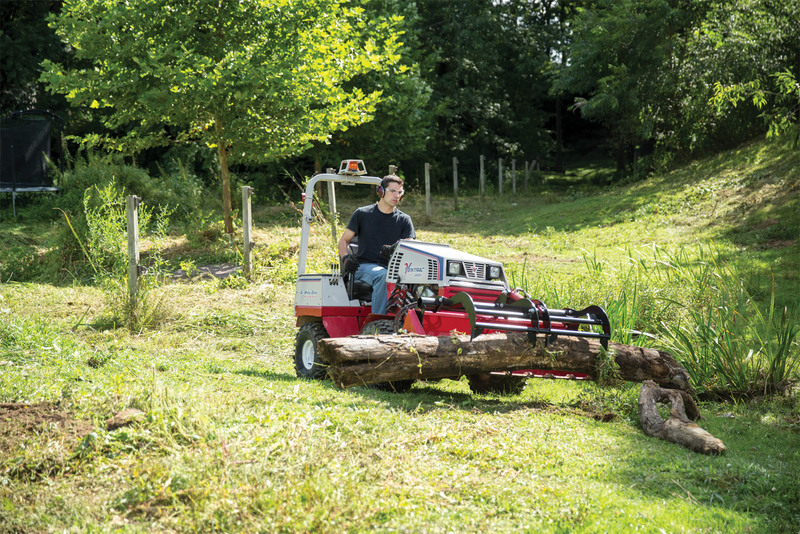 Very impressive machine… and the hydraulic braking will not allow you to freewheel down those slopes like most hydro tractors will let you do. I feel 100% safe on this machine. The cutting deck is amazing and throws grass very far and never clumps… even in wet grass. I can’t wait to try my slip scoop on the 18 Yard of mulch I need for my property. And last season’s near record snowfall in Western PA, I can’t wait to try the blade on my 600 foot driveway which is all downhill. As a homeowner who suffered trying to take care of over 4 acres of hilly terrain, I have found my one tractor solution to take care of my property at last! 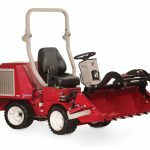 3200 diesel with snow blower, sweeper, mower deck, scoop and snow blower. I service multiple properties on a busy boulevard in Warwick RI. A portion of our work is to service a 24/7 operation center. Due to the concerns for the employees and the general public we are required to service the walkways frequently during a snow/ice event. In most cases it’s a battle because the cities plow trucks push the road snow onto the walks soon after we complete our work on the walks, so it’s repeated multiple times per storm. The contract requires walks to be clear for the safety of employees and public. One sidewalk we maintain is over 1200 feet. Without the Ventrac sweeper or blower we would be back out there behind a walk behind blower. This would take 3 employees, and take 4 times longer to complete. The heated cab makes it so you can operate comfortably. The new scoop and sweeper worked out well in a recent job installing fire signal cable on a project with 12 buildings located on a landscaped area. We trenched 2500 feet. The back fill operation was partially completed with the scoop and sweeper on the grass. The turf tires and articulation made it such that our repair to the site was 1/3 than what we had budgeted for. The grounds keeper was very happy. 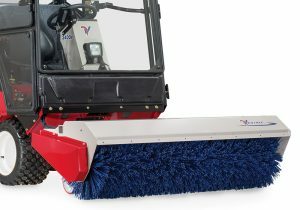 The Ventrac equipment has serviced my company well with a variety of applications for the attachments. Bert Hillyard Topaz Property Services Ltd.
My name is Bert Hillyard of Topaz Property Services from Sault St. Marie, Ontario. We have about fifty-two hundred driveways that we took care of this winter, and we have about one hundred and fifteen lawns a week that we take care of. We’ve been in business for twelve years and plan to do it for many more. We were looking to upgrade our equipment when we came across Ventrac, and the end result was we bought a used unit to try one out. We used it all summer. When we started using it with the blowing unit, the lawn deck, the sweeping unit it was “wow” for us! Why did we suffer for the first six years with these other pieces of equipment when we could of had this? 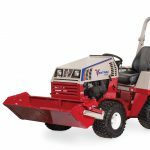 As used as the equipment was everything worked, we could get parts for it and that just gives you confidence in Ventrac as a corporation and in the equipment itself. Then we said okay, now we’re going to get a new one and we bought two more and we’re looking at our fifth one this fall. No one else is running any kind of equipment in the residential market like we have. A lot of them have got walk behind mowers. So they’re out, they’re exposed to the 37 below and that’s all we’re working with this winter, 37 below zero. You have the safety factor where the skin can freeze in 10 minutes. Whereas, our fellas are in the heated cab and they’ve got their coffee holder, which you don’t have those built-in the cab yet but we mounted those as a modification. They don’t have the Hawaiian shirts on yet, but they’ve threatened to do that just to make the other fellas feel that much worse. We have it where we are doing eleven or twelve driveways each hour with the machines and that’s including the travel time and getting the driveway done. The driveways are getting done between fifty seconds and two minutes, depending on the size of the driveway. People are happy. A lot of times they will stand at their windows with a cup of coffee and just peek out the window and say, oh yea, there they are, and oh, now their gone. Thank you very much. And they’re happy. So the clients are happy, we’re happy. The equipment’s running well and it’s just great. We start with one service, then they might say “Hey, can you come and blow my snow”. We start out blowing their snow and then they say “Oh, can you do aerating for us”, and yes, we can do the aerating, we can do the lawn, we can do the mulch, their grass cutting, and in the fall we can do their leaves. We start out with one service and we can offer them five or six services with the same unit. We are always looking at what other service are they looking for and is there an attachment that we can put on our Ventrac. Other companies call us for help because they’ve got problems with their machines. They’re down, they’re trying to keep their clients, keep going and say “Hey, can you help us?” Although he’s the competitor we’re helping him to keep going and it’s making sure those people get out, you know. And sometime down the road if he decides to give up they’ll refer the clients to us. The versatility, to be able to have those attachments, those units, be able to change so fast, do that quick change over, and then be able to meet the needs of your clients like that is something that I think is very unique to Ventrac. We plan on having one of the largest fleet of Ventracs in Northern Ontario. I use and abuse our ventrac and attachments, grinning with joy all the while. 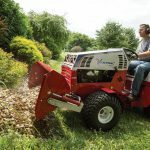 When we first looked at Ventrac to do slopes on a steep bank we were using out-fronts and zero-turns and they couldn’t hold the slope, but the Ventrac could. So we either had to weed-eat or buy a Ventrac. Also, one of our biggest things is snow removal with the broom. It’s our job to get the sidewalks clean so the students can get out as soon as possible. It would take six people to do what one person can do with that machine in an hour with the broom. We’ve shoveled and used the broom and we prefer the broom. The crew cited the broom as being one of the most valuable assets for the daunting task that snow removal can be. For example, the broom has helped them to prevent breaking up bricks when clearing snow from brick walk-ways. With the broom, they’ve even been able to accomplish in an hour what would have taken six people to do. They’ve held up well on Main Campus. We’ve taken care of them and we do our own maintenance on them. We put a lot of hurt on it. My name is Glenn Garrett, president and founder of Retention Pond Services based in Wilmington North Carolina. We maintain, build, and repair storm water systems throughout the Southeast United States, and right now we operate in about ten states. Slopes to the ponds tend to be hilly, they’re vegetated and can be wet and mucky. It’s definitely a slippery kind of environment, but the grass grows and has to be cut and maintained according to state codes. Over the years we’ve bought approximately sixty-five Ventracs. 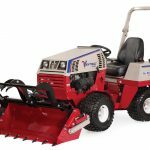 We had a slope mower and we ran the Ventrac alongside the other competitor model and we found the Ventracs were superior. They were faster, easier to maintain, and did a better job in the wetter slopes and pond bottoms. We’ve actually run tests with the crew and with the Ventrac units, and what we’ve found is the one Ventrac can replace twelve guys with large commercial grade weed eaters. The machines are just that much more efficient. The savings the company has experienced the last ten years has been huge. We have a minimal training from the standpoint that the men learned so quickly how to operate the machines. It’s not like you’re driving an excavator or a bulldozer. It’s very simple, similar to a lawnmower. The operators like a low center of gravity, it gives them confidence. They like a machine they can sit in instead of on top of and Ventrac offers them that. It’s been a huge savings through both workers comp and through the speed in which ponds get cut. As a business owner we can’t afford to have workers comp claims involving the water and machines that roll over and that sort of thing. 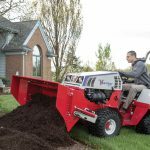 The Ventrac has prevented those types of claims from occurring. We’re using Ventracs pretty much everywhere we are. All of our mowing crews have two Ventracs. With a heavy machine taken into these wet moist areas we tend to get ruts from the tires. With the Ventracs and the dual wheel kits and the low ground pressure you significantly reduce your footprint exposure to the ground so you don’t tear up everything when you go through it. You see a lot of slopes and banks where machines have cut and slid. 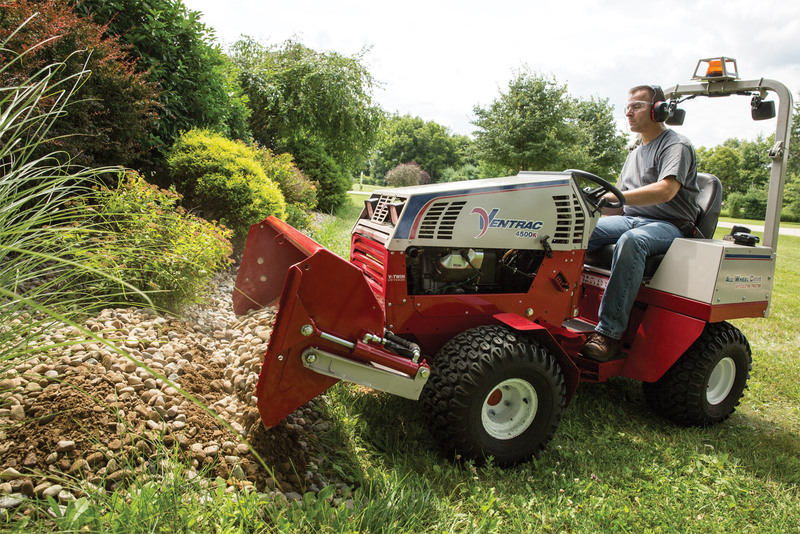 The Ventracs don’t tend to do that; they tend to stay put when you operate them on the side slope. In addition to mowers, we also have trenchers, rakes, cultivators, and numerous attachments to kind of adapt to the pond. The brooms have been great options for us. They give you the ability to clean up like a dedicated broom machine, but you don’t tie up all that money in a one purpose built machine. The Ventracs have been integral in the operation, you get increased productivity when your people get comfortable with the machines and they’re intuitive. 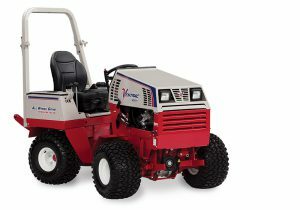 I think the Ventrac is like that when you sit in them and drive them, once you get used to the steering and how they operate. I think it does make the men more productive so I would say that has been a positive experience and allowed the company to grow. We’ve actually ran test with the crew and with the Ventrac units, and what we’ve found is the one Ventrac can replace twelve guys with large commercial grade weed eaters. The machines are just that much more efficient. Barry Frey was unaware how his new client would change his life. It was 2002, and Frey – pronounced “Fry” – was simply looking for clients to add to the roster of his Smithfield PA-based landscaping and snow removal business. But when a local hospital called to inform him that he’d just won the contract for their grounds maintenance, he suddenly realized he needed a new tractor. Complicating matters was that every winter the hospital would end up with a lawsuit because of an ice-related slip and fall. Frey knew the pressure was on when he started his search for a machine that would fit into the workload created by his business. 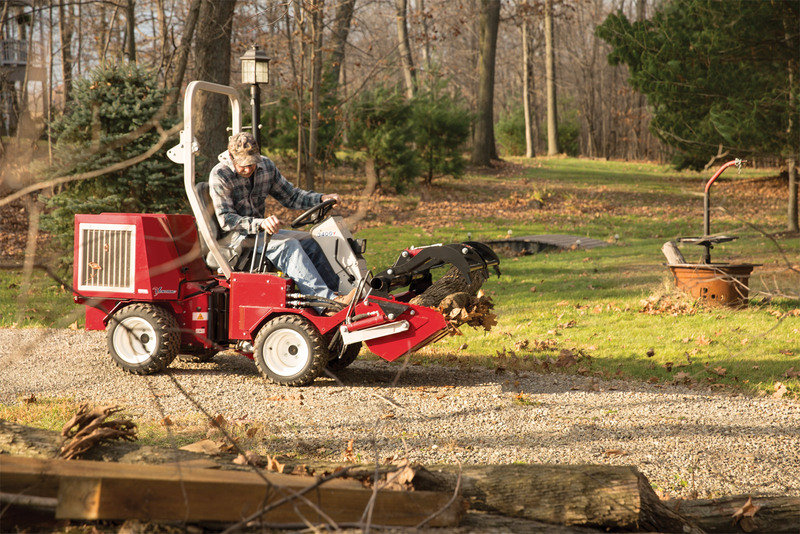 The first winter with the Ventrac was a trial by fire for Frey. A major blizzard settled over the Smithfield area, keeping him busy running the Ventrac across the hospital’s parking lot and sidewalks. The unit’s versatility meant he could attach a blade or a power broom on the front end and a spreader filled with calcium chloride on the back. This allowed him to lay the chemical down as soon as the sidewalk was clear, so glaze never had the chance to form. Frey’s business now runs three Ventracs all year long – one 3000 series and two 4000 series. The optional heated cab comes out for winter use on Frey’s primary snow movers. 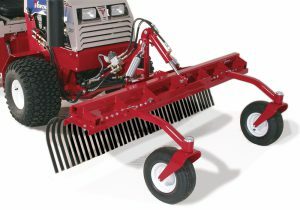 “My pickups all have seven foot blades on them,” he explained, “while the Ventrac blade is six feet. 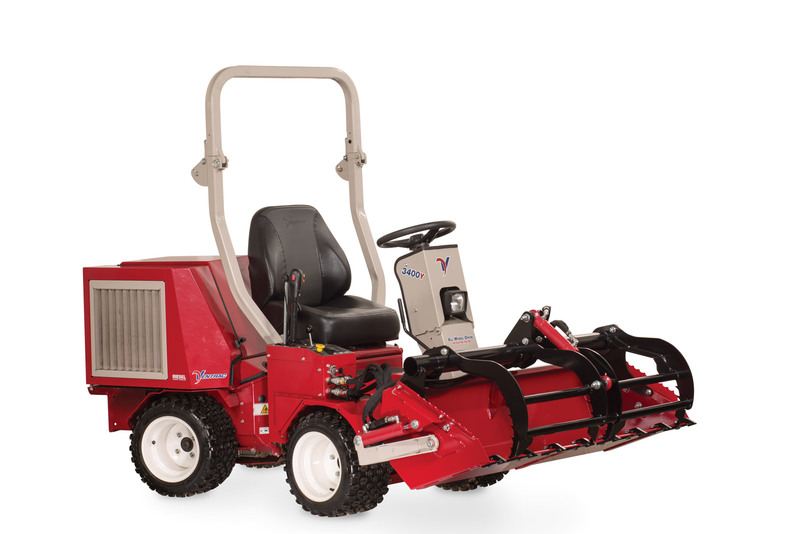 But what the blade lacks in length, the Ventrac makes up for in speed, maneuverability, and visibility. We can get in and out fast, make turns that a pickup can’t make, and we can see all around.” He added that durability is also an issue. He says that his pickup trucks are all beaten up from the abuse of removing snow, but his Ventracs are all in great shape. The story might end there were it not for the twist that came next. Realizing the potential in the machines he had bought and having a first-hand understanding of how hard they worked, Frey realized that others must be looking for the same qualities as well. As a result, he decided to become a Ventrac dealer. My name is Jeff Hostetler. I played in the NFL for fifteen years. I was the winning quarterback for the New York Giants in Super Bowl XXV. I’ve been a contractor now for the past ten years and on the professional level, build some homes and develop some property. I currently live in Morgantown, West Virginia. I have a small horse farm. We have about forty acres and if you’ve been to West Virginia you realize there is no flat land. So we have a lot of hillsides and challenging areas to cut and mow. I was looking for something that was going to be more manageable on hillsides, more maneuverable and safer than the current tractor that I was using. So I looked around and I actually came across a Ventrac dealership that was within a couple miles of my home. What caught my attention was they had this Ventrac out in the front parked on a hill side and I was thinking how in the world did they even get it there. So it kind of stirred my interest. I talked to the gentleman that had the dealership and he was a great salesman. He brought it out and said here, try it out. He showed me how the thing worked and operated and took me to some of the slopes that I have around the property and I was sold. One of the biggest selling points for me was how secure I felt in the tractor being on some of these hillsides. When the salesman came out and drove it around I was able to watch him and I was nervous. Seeing him on some of the hillsides I’m thinking I will never be able to do that. But once you get in the seat it is a completely different feeling. You’re sitting low… it has such a great base that there are areas you get in and you hardly even know that you are on a hillside. Where as previously, the tractor that I had sat up very high and I was always concerned about rolling over or slipping. But this Ventrac is awesome, it is so impressive. Anybody that I see, I’m always telling them “I do all of this on a Ventrac”. One of the great surprises for me was the versatility of the Ventrac. I had bought it basically to mow and all of a sudden I realized that there are all of these additional attachments that you can get. For me, on this forty acre piece of property and also as a contractor and a builder, I discovered they have a power rake which for yards and for landscaping, and I have a riding ring with horses, I use to keep that fluffed up and looking good and rock free. That has been an awesome piece of equipment. I also have lots of trees here on the property and in the fall where it took me weeks to get rid of all our leaves, I was able to do the same job in about five hours with the leaf blower that you’re able to put in the front. To be able to control it, the velocity, it is awesome. To save seven to ten days of work and be able to whittle that down to five hours on a Ventrac is pretty impressive. 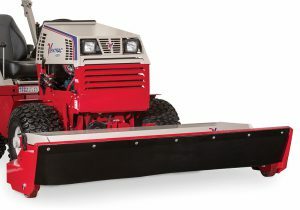 Looking at Ventrac, I can say that is a professional machine. In my eyes being in the NFL, in that profession for fifteen years, you’re at the top of the line in that profession and to get there you had to do a lot of work – you’ve had to go through a lot of tough times- you’ve had to do a lot of research – you’ve had to do a lot of study – you have to prepare yourself – you have to be tough – you have to be durable and all of those things, I can relate to this piece of equipment. It is well made, it is VERY tough, it is sturdy and it performs. There is no doubt in my mind that that is a piece of professional equipment. This thing is well built, it’s muscle. Yet it has the finesse that you need to work around delicate items in yards and things like that, I’m totally impressed with this thing. This is a big leaguer.